The Guitaret is an electric lamellophone made by Hohner and invented by Ernst Zacharias, in 1963. 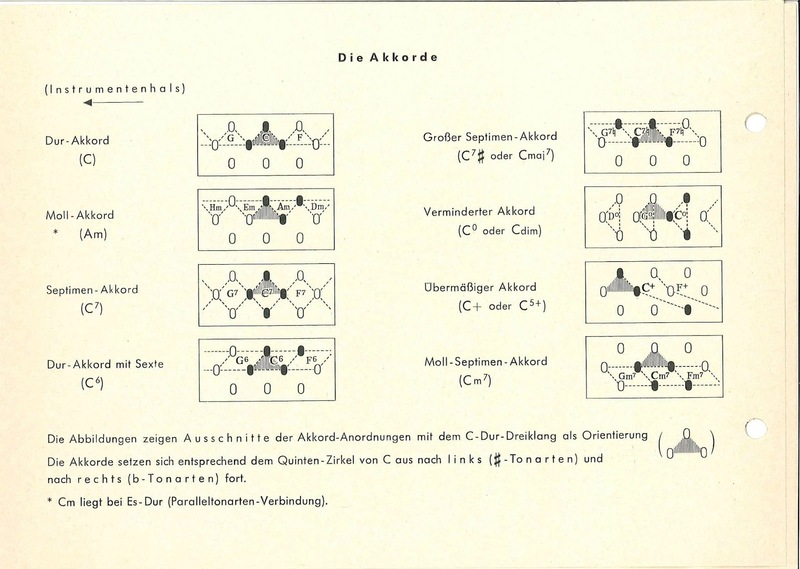 Ernst Zacharias (born 21 June 1924) is a German musician and engineer. 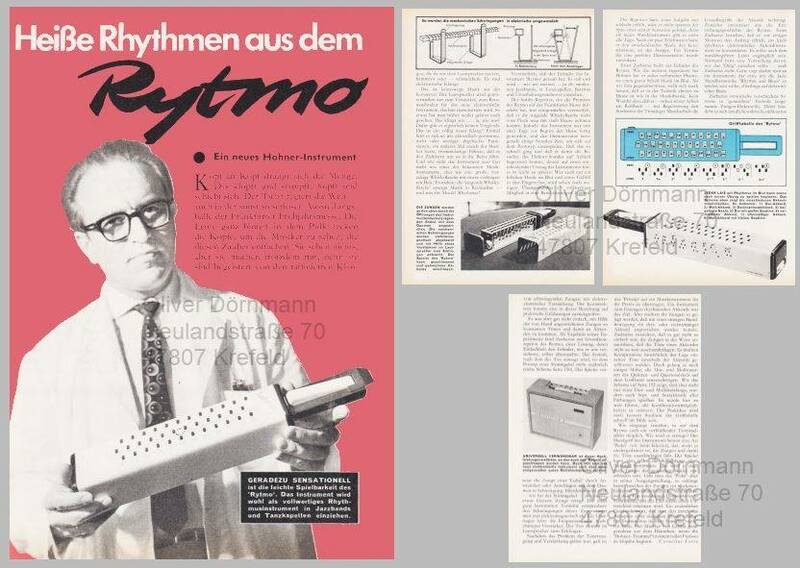 In the 1950s and 1960s, he invented various electro-mechanical musical instruments for the German musical instrument manufacturer Hohner, including the Cembalet, the Clavinet, the Guitaret, and the Pianet. 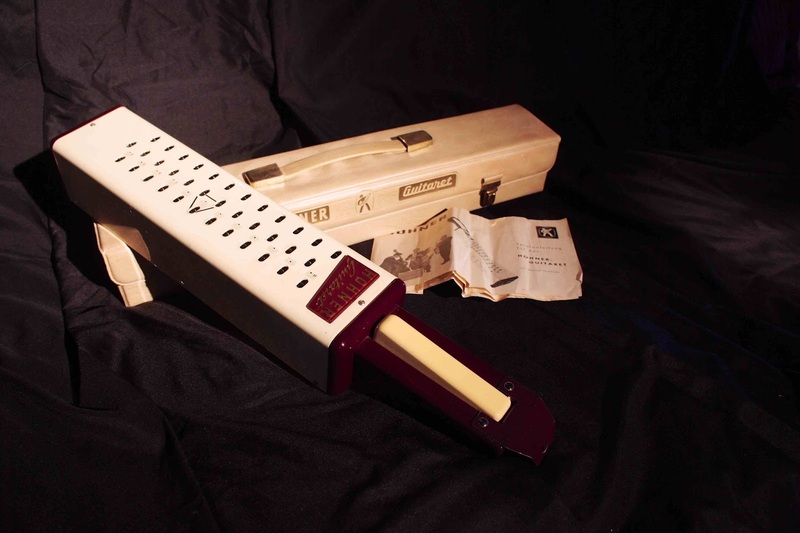 The Claviola, a modernisation of the sheng and the Harmonetta, a mouth-blown concertina-keyboarded instrument, were also invented by Zacharias. 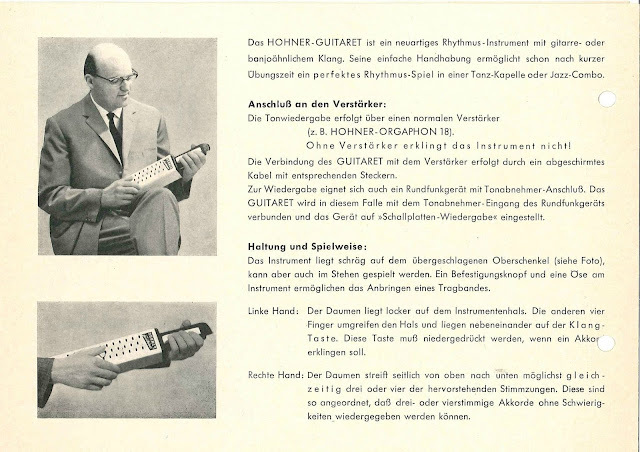 DEPATIS lists 90 patents by Ernst Zacharias for Hohner, including plastic recorders and watch and clock mechanisms. It was only produced for two years. 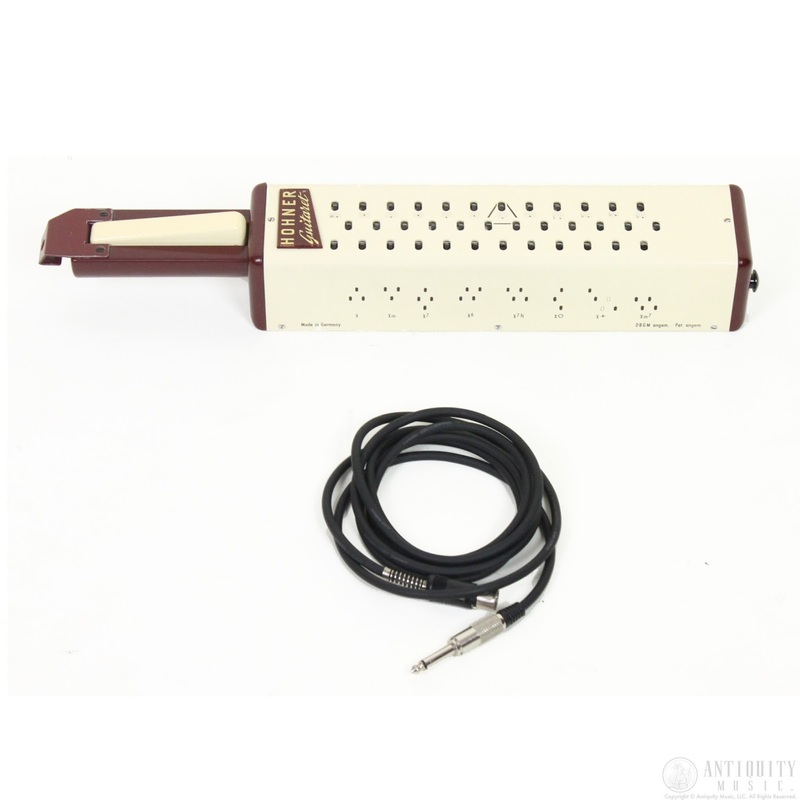 The Guitaret has a tone something like an electric thumb piano (kalimba) and a plucked guitar or banjo. 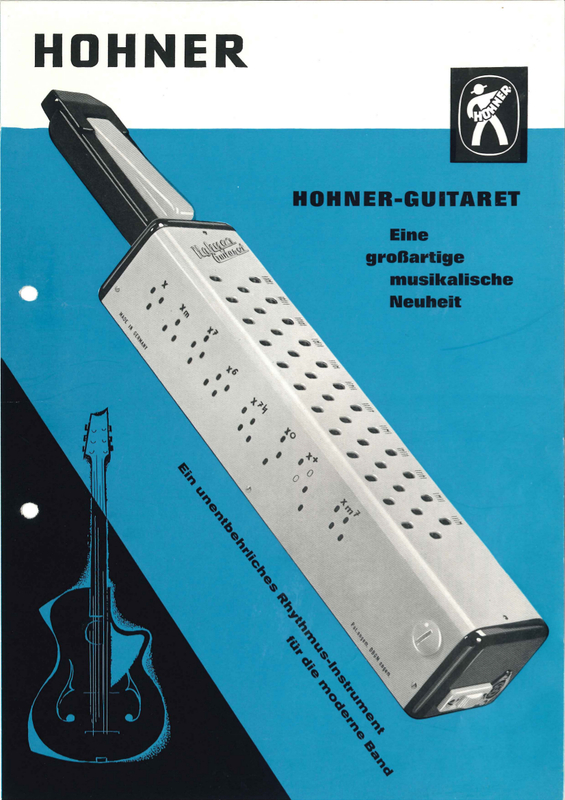 The instrument itself was not popular, and was dropped from the product line in 1965, presumably because it failed to excite the market. 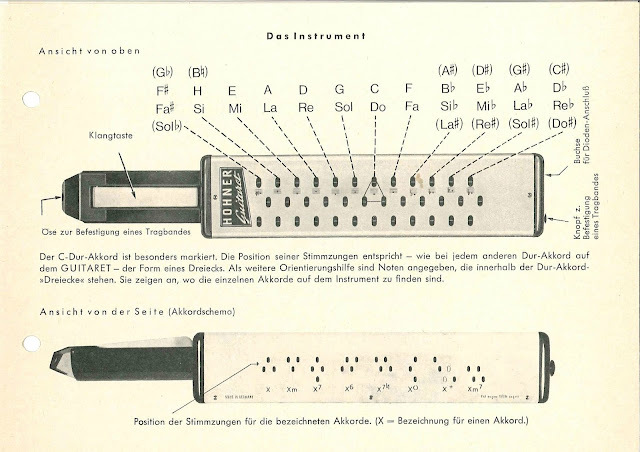 It was one of a number of experiments that Zacharias made converting non-standard musical instruments to modern ones. 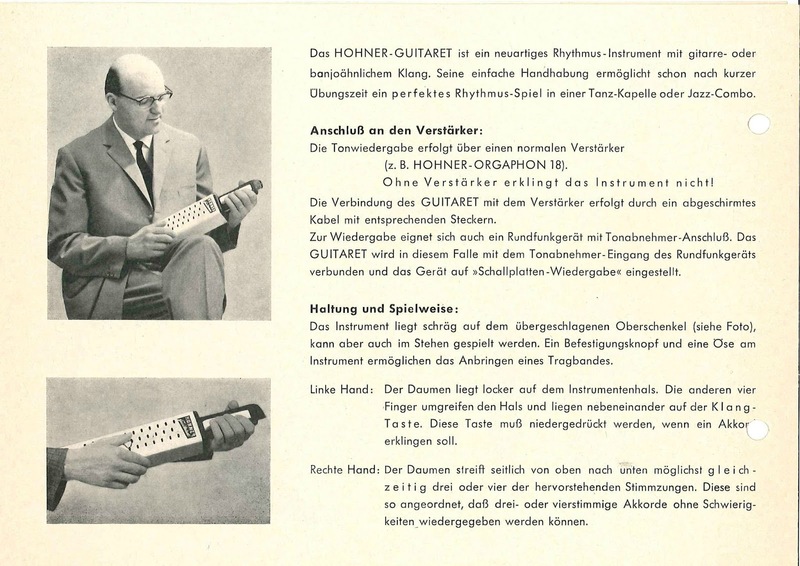 Guitarets that have survived have problems with the reed dampening system, which means that the instrument has come to be played with two hands. Despite its obsolescence, its distinct tone has made it popular in both retro- and colourist settings, and it has experienced somewhat of a revival. 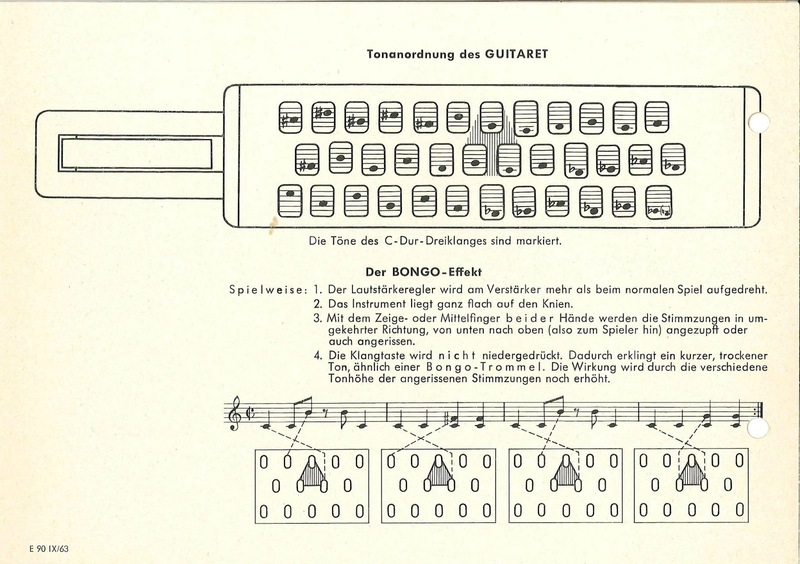 It has been featured in soundtracks recently for this very reason.The Guitaret's sound is that of a thumb piano. 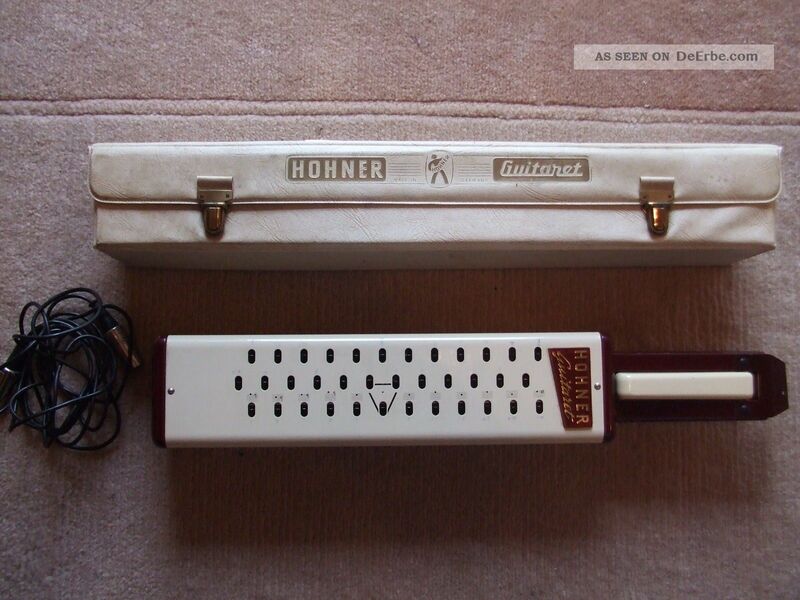 It is plugged into an amplifier, and sounds like an electric thumb piano. The Guitaret is a rationalised lamellophone, making use of metal reeds or tines which are arranged in three rows within a white painted metal rectangular case approximately 30 centimetres long. 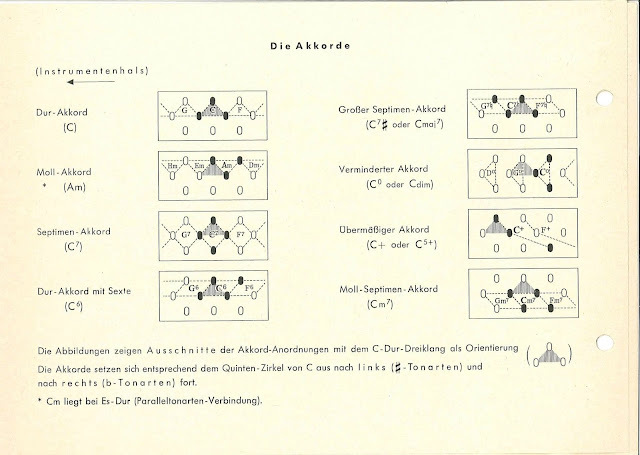 The ends of the tines protrude slightly above the level of the casing. 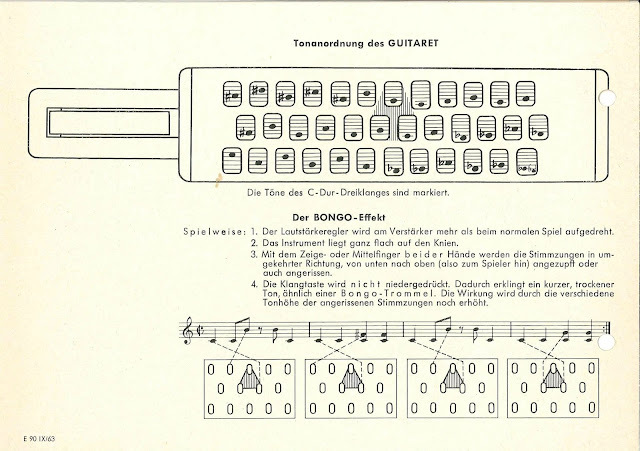 The player takes the guitaret with the left hand on the handle and uses the thumb of the right hand to pluck the tines. 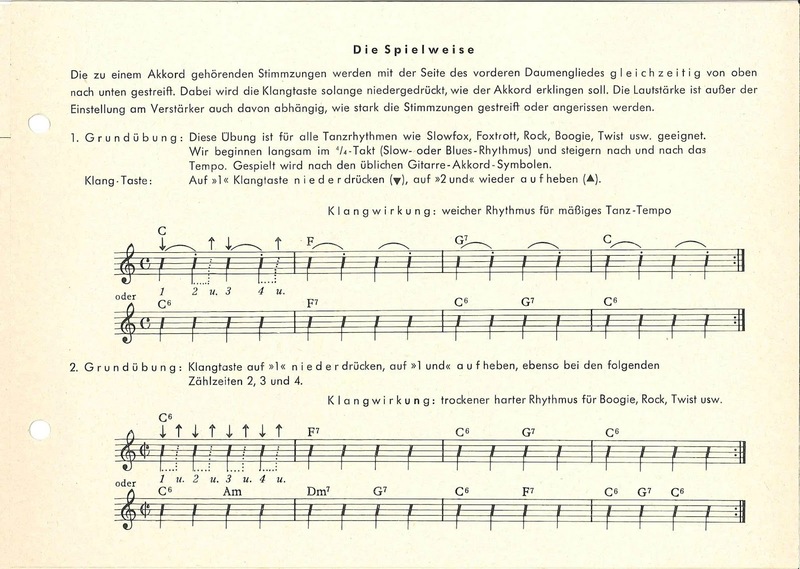 There are hidden tines that resonate with the plucked tines to swell the sounds. 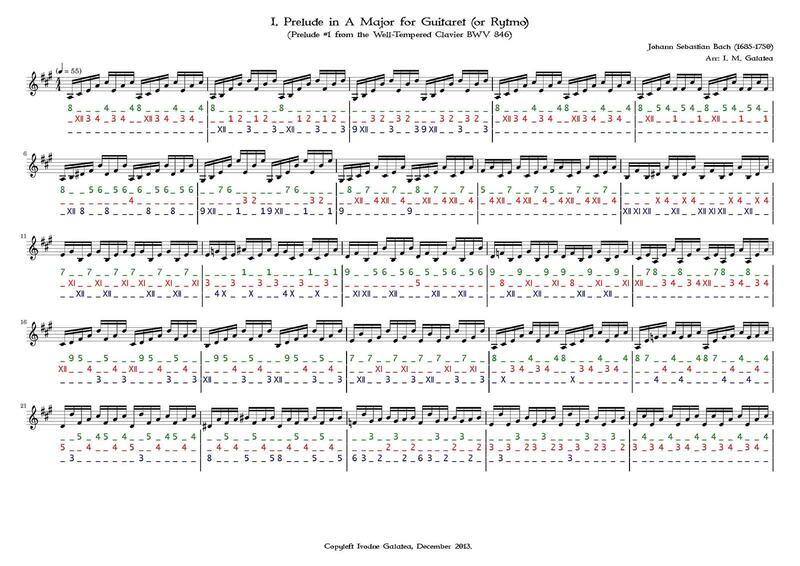 Although there are 3 rows of 12 tines each, there are only 15 actual tones, ranging from G♯3 to E5 owing to repetition. 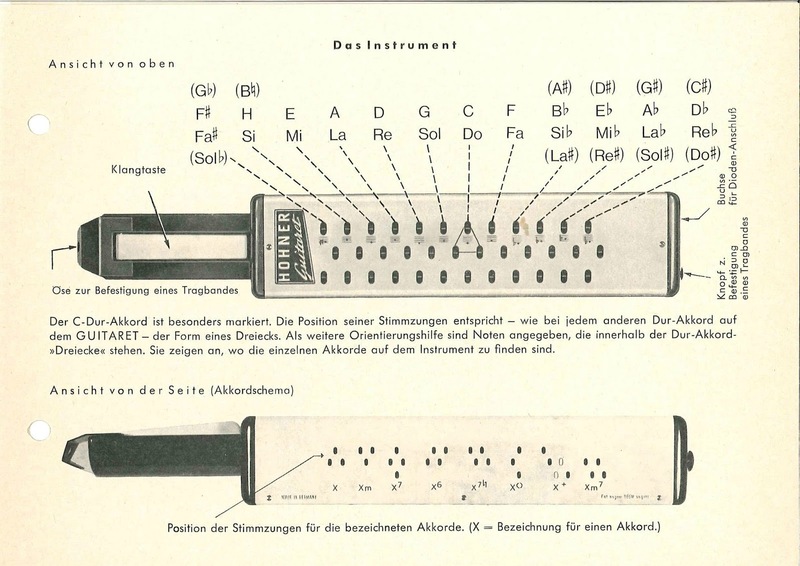 The instrument is amplified up by an single electromagnetic pickup which is wrapped around all of the tines. The coil is directly connected to the output to the amplifier, it has no built-in amplification. 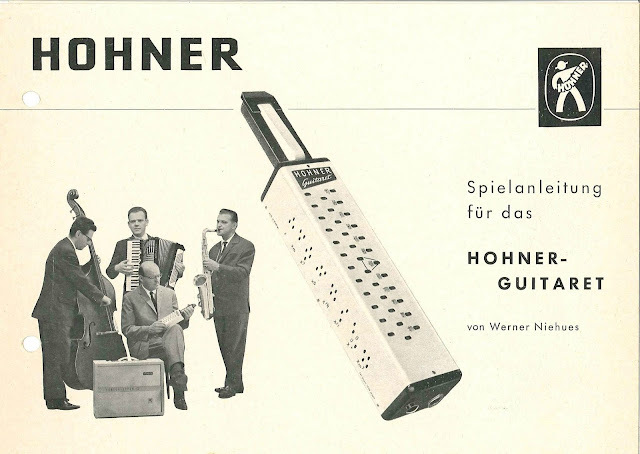 The sound of the instrument on its own is very soft. 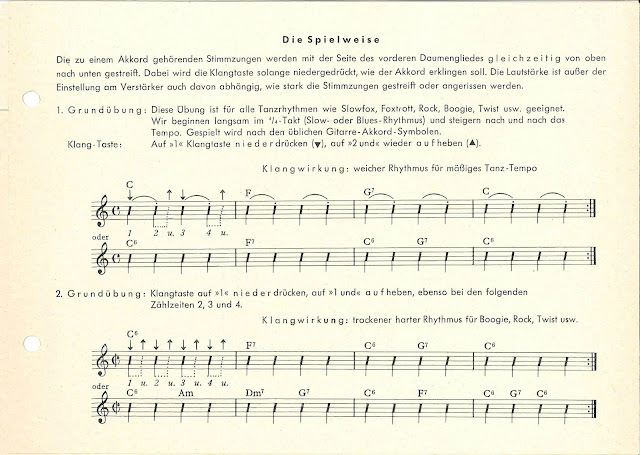 An alternative method of two handed multi-finger playing is listed in the Facebook Guitaret Page as being invented by Lalli Barriere with the damper button held down with elastic bands, while Ivodne Galatea has created a five finger right-hand style for playing classical music, with the left hand being used for damping. 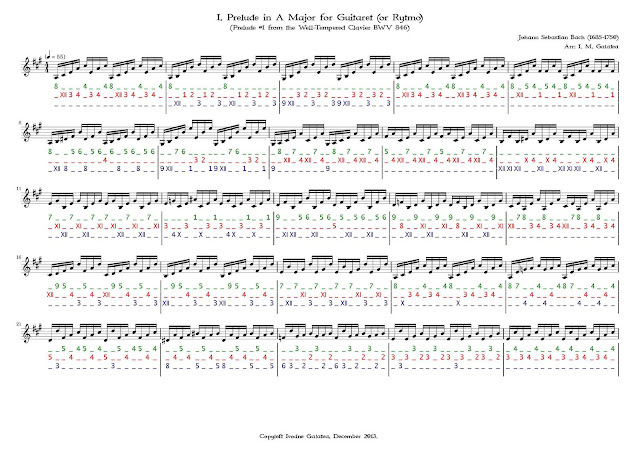 Galatea has also created a tablature for playing the instrument classically and has arranged a repertoire for it from Bach, Beethoven and Debussy, as well as an arrangement for Guitaret consort of Reilly's In C.